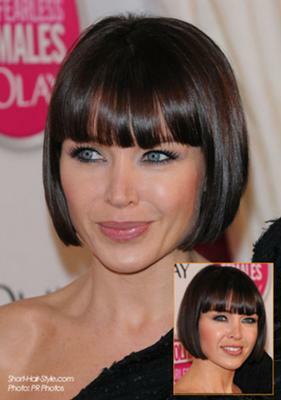 Short, classic and timeless bob hairstyle with full bangs in dark brunette hair color. Suitable best for straight hair with normal to thick hair types. Watch out if you have round face, as this style will make your face rounder. What makes this style special is the heavy bangs on front - A true high impact style! Due to its sharpness this style is not very simple to keep! Depending on your hair texture, expect blow-drying every morning and regular trimming every four weeks.